We’ve come a long way since the tub and washboard, but doing the laundry can still feel like drudgery if your laundry area needs help. If the floor’s concrete, painting it and adding a bit of carpet underfoot helps. keep the floor clear with laundry sorting bins. You might want shelves and labeled baskets to catch the stuff that seems to collect here. Take a space-saving cue from older homes: a drop-down ironing board or work surface can hide away when you’re not using them. and you can get twenty-five feet of hanging space with a wall-mounted accordion style drying rack. 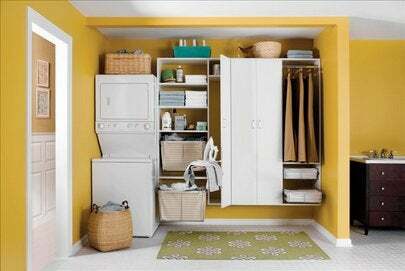 If your laundry machines are in the mudroom or hallway, a countertop and a curtain over them could make it more useful space. The pedestal drawers on many new machines keep them well off the floor, hide the detergent and save your back while you load and unload the laundry. And always look for the energy star label to save water and energy costs. Bob Vila Radio is a newly launched daily radio spot carried on more than 60 stations around the country (and growing). You can get your daily dose here, by listening—or reading—to Bob’s 60-second home improvement radio tip of the day. Get more info at BobVila.com…and right here at home with me, Bob Vila!